Medicinal uses: Coltsfoot is an effective demulcent and expectorant herb and is a common remedy for chest problems in Europe. Both leaves and flowers can be taken as a decoction for chest conditions, the leaves being preferred in Europe and the flowers in China. This herb is used as a specific treatment for spasmodic coughs. Cautions: Use of coltsfoot flowers is not recommended. Do not take the leaves for longer than 3-4 weeks at a time. 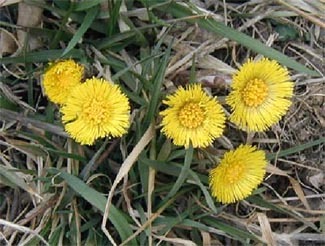 Do not use coltsfoot while pregnant or breastfeeding. It is also not suitable for children under 6 (Chevallier 278-9).